Climate Change, Ocean Acidification, loss of biodiversity…none of the interconnected macro-level challenges facing humanity has featured in the current UK election. Peter Wadhams, Professor of Ocean Physics at Cambridge, along with 10 colleagues, had a letter published in The Independent on 17th April urging urgent action. The mainstream parties continue to talk about all the other issues that interest them, seemingly unaware of the gravity of the situation facing humanity. The future of our public services or the size of the national debt may be important issues, but in relative terms they are utterly trivial in comparison to these macro-ecological challenges. There seem to me to be three paths, political, activist and lifestyle. I’ve been trying all three for a very long time, so let me reflect on their relative worth. Let’s start with the political. The mainstream parties have always been pretty hopeless. I’ve been a Green Party, and before that Ecology Party empathizer, supporter, voter and often a member since the founding days in 1973. I’ve never voted for a candidate who has even got their deposit back, let alone got into Parliament. It has at times been a pretty dispiriting experience, and there have been times when I’ve given up on politics. In a democracy it is a numbers game, and most people are simply not interested in engaging with these macro-ecological challenges. Of course the Greens never were a single issue party, but the understanding of these challenges and the scale of the changes required does underpin their thinking about everything else, unlike with any of the old major parties. It has been very heartening to see the quadrupling of Green Party membership over the last year, and in a few constituencies, but sadly not mine, the chances of victory on 7th May are looking very encouraging. So if creating meaningful and rapid change through party politics has been frustrating, we could try activism. Again I’ve been involved in a rather sporadic way for decades. I’ve supported Friends of Earth, Greenpeace and a host of other campaigning groups for many years. The internet has allowed new forms of activism, through groups such as Avaaz, the potential of which I get pretty excited about when I see some of their most successful campaigns. Many local communities have Transition Towns or similar groups. I do quite a few talks to these types of groups. Great people: concerned, spirited, passionate. I wish a few cabinet ministers and leading business people would join us sometimes, but they never do. They seem to inhabit a different universe. I’d certainly love the opportunity to present one of my talks to them! Some activist groups resort to the courts. 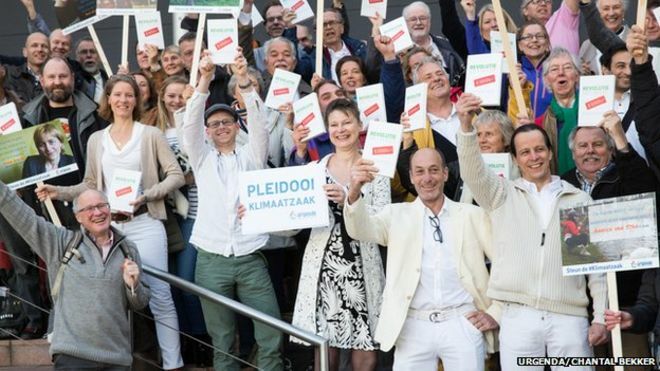 A group of Dutch citizens, along with Prof James Hansen, are taking the Dutch government to court for inaction on climate change. Inaction to protect humanity from climate change is an infringement of universal human rights. If a precedent is set in Holland it could have interesting ramifications globally. Many environmentalists focus on individual lifestyle choices. CRAGS or carbon action rationing groups was one such path; others advocate vegan or local food, pacifism, prayer or meditation. Many of us in the 1970’s thought a return to the country, growing our own food, building our own houses and perhaps living communally were vital steps. Some people still do. I tried all manner of experimental, consumption minimizing lifestyles, for a while even living in a cave! Now I see individual lifestyle choices as still important, but certainly not enough on their own. On a daily basis how each of us chooses to divide up our time into these various spheres of activity, and balance it all with the many other demands on our time, such as work, family and health, is of course a very personal matter. However you personally decide to take action, Good Luck! Onwards, Together! This entry was posted in Climate Change, Environmental, Politics on 22 April 2015 by Richard. 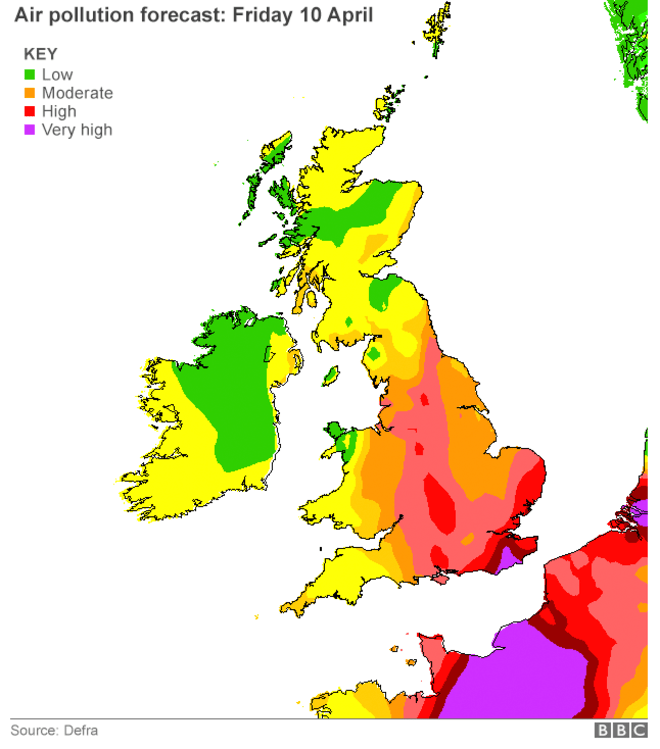 Last Friday the air quality of parts of the UK was pretty bad, and over much of Europe it was worse. Even here in Hereford, where it wasn’t so bad, I was coughing, the air smelt weird, and the sky had an ominous haze. Globally poor air quality kills a lot of people: 3.7 million due to outside pollutants from factories, power stations and traffic, a further 4.3 million due to poor indoor air quality, mainly due to cooking over wood, charcoal and dung fires, and a further 6.0 million due to smoking. Plenty of other things humans do cause unnecessary deaths: road traffic accidents 1.24 million, alcohol misuse 3.3 million, illegal drug use 0.2 million. These are all examples of the steady annual unnecessary death toll: warfare and infectious diseases cause huge episodic death tolls. I’ve always believed a safer, healthier and happier future is possible for all humanity. There are plenty of grim news stories to show how far we have to go, but there are also many examples of success. Banning coal fires did end the ‘pea souper smogs’ of post war London, strategic long term investment in health and education has dramatically lifted life expectancy and prosperity in Singapore, recent elections in Sri Lanka and Nigeria were good news for the spread of democracy. This blog is called ‘Global Problems: Global Solutions’ for the simple reason that I believe that there are, at least theoretically and technologically, solutions to many if not all the problems facing humanity. A growing number of people around the world share this vision: Avaaz’s membership has grown to 41 million, but of course this is just the tip of the iceberg. The question is, has humanity the political will to really tackle the big problems together. In cooperating effectively we might find we can tackle multiple problems simultaneously and produce multiple win-win situations. Delhi and Beijing are two of the cities with the very worst air quality, but most of the world’s major cities suffer poor air quality at times. Recent announcements from the Indian, Chinese and other governments are sounding like they intend to take action. Over London we now measure a thousand different chemicals and particulates to better understand the nature of the problem. What we need to see emerging is a race between the world’s major cities to see who can clean-up local air quality fastest, and in the most beneficial way. Many of the solutions are very obvious: more walking, cycling and better and cleaner public transport and fewer cars, especially fossil fuelled cars. Tougher emission rules for factories. Shutting coal fired power stations and replacing them predominantly with renewables. All pretty obvious stuff, and beginning to happen, and of course all having multiple benefits for human health, local air quality and also, and almost incidentally, climate change. This entry was posted in Environmental, Global on 13 April 2015 by Richard. In February I blogged about China and how it’s carbon emissions skyrocketed during the decade 2002 to 2012. I speculated that emissions might soon start to fall. Over the last few weeks a number of articles seem to be suggesting that things are beginning to change for the better in a very profound way. China’s economic boom has largely been driven by massive coal use. The switch away from coal now seems to be gathering pace, triggered largely by the need to improve urban air quality, and also by the desire to take action on climate change. From 2013 to 2014 Chinese carbon emission fell by 2%. The question is, is this an anomaly or the start of increasingly rapid falls? The evidence is mounting that it is the start of something very good for China and for the world. In January new laws came in to ban the import of the dirtiest coal, with the highest ash and sulphur content. This will have significant impacts on coal mining in Australia and Indonesia who’ll loose a major market. Many of their coal mines will close. China also plans to close 2,000 of its smaller coal mines. Beijing used to have four coal-fired power stations in the city just a couple of years ago: by next year the last one is due to close as urban air quality improvements are sought. They will be replaced by gas, and by renewables. Investment in renewables in China is growing at around 30 to 60% per year. In 2004 annual investment was just $3 billion, by 2013 $56.3 billion was invested, and by 2014 this was $89.5 billion, probably this year the $100 billion threshold will be passed. Cumulatively over the coming decade trillions will be invested, hopefully decoupling economic growth from rising carbon emissions. One example is that China plans to triple its solar power to 70,000MW installed capacity by 2017. The Asian Infrastructure Investment Bank is being set-up and funded largely by China, but just about every country on Earth, except the USA, is getting behind it. It will probably be a huge boost, channeling multi-trillion dollar investments predominantly into the Chinese Cleantec sector. It could also act to strengthen regional electricity and gas pipeline interconnection, bringing Australian solar power, Indonesian tidal, geothermal and biomass, Mongolian wind, solar from the high deserts of the Tibetan Plateau and offshore wind, tidal and OTEC energy resources into the huge energy markets of eastern China, South Korea and Japan. Stewart Taggart from Grenatec (Green Renaissance through Advanced Technology) has been arguing for these large scale energy market reforms and infrastructure investments for many years. Now these ideas are moving centre stage, and could facilitate the plummeting of Chinese and worldwide carbon emissions. Many commentators on Climate Change, such as Jeremy Leggett are sounding more optimistic than ever before. The mood ahead of the Paris Conference is sounding very much more ‘can do’, and the fossil fuel disinvestment campaign is gathering momentum, just as the Cleantec industries are really scaling up, and now the financial resources are coming on stream. The next few years will prove pivotal, and I for one will be looking out with interest to see if China, and other countries, can really decouple economic growth from carbon emissions, and myriad other forms of pollution. Is universal prosperity compatible with ecological sustainability: the evidence of the next decade will be critical for the future of humanity. This entry was posted in Climate Change, Energy, Environmental, Global on 5 April 2015 by Richard.